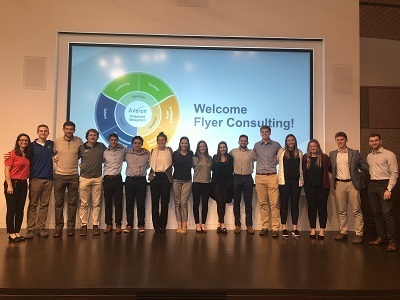 Flyer Consulting (FC) is a student-run organization providing complimentary business consulting to nonprofit organizations. FC works to promote economic growth locally and around the world through business development, entrepreneurial mentorship, and loan pipeline management. … is introduced to opportunities to work with real businesses within the Dayton community and beyond. All members are in charge of delivering some amount of work to a client, whether that be as a Consultant, Project Lead, or Managing Director. Members continuously strive to develop and enhance their professional skills through these roles as well as by attending speaker events and participating in training with partner companies. By applying the skills and techniques learned in the classroom to business problems faced by local, regional, national and international nonprofits, FC members are able to augment their education with relevant real-world experience. Members gain knowledge by doing everything from rebranding a business to data science work to managing a microlending pipeline, all while still in college. UD students can find out more about Flyer Consulting on their website Flyerconsulting.com. Other questions can be directed to flyerconsulting@gmail.com.